As summer hits its stride #MetaBeers returns shortly at the The Draft House (Chancery). In June we talked about people’s own experiences of content discovery, then we had the only metadata pub quiz with floral prizes, and of course excellent food and drink. The next date for your diary (as advertised in our newsletter) is Wednesday 20 July from 6:30pm for a 7pm start. We’ll be talking about our own experiences of finding content. Join us! 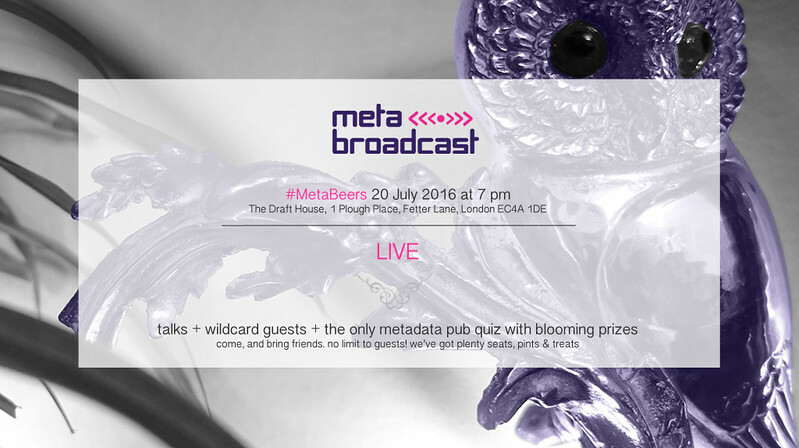 You sign up to #MetaBeers, RSVP the invite, and come along with all the +1s you like. We prepare talks, buy pints & treats, then we all gather round and make merry. We’re having as many 5 minute talks as needed to cover the theme, but never more than 1 hour. If you’d like a spot (this month, in May, etc.) on the running order, do get in touch*. next time: what about august? In August TV will be dominated by the Olympics, those 2 weeks in every 4 years where a significant part of the world comes together to watch live a set of mostly otherwise minority sports. #MetaBeers will be right in the middle of it. We’ll watch some, talk some, and discuss what can be learned for the other 206 weeks of each 4 year Olympic cycle. Looking further into the future, in September we’ll talk about the immersive power of TV shows that feel like movies. Mad Men, Sherlock and True Detective come to mind. But that’s still a way away. For now, please do join us on Wednesday, July 20th. Updated: a few times 18-20 July, to add to the schedule.